Is this a Piece of Cloth or a Piece of Art? If we look in the dictionary, painting is the practice of applying paint, pigment, color or other medium to a surface. What do you think this painting represents? Would you think it is actually a handmade silk scarf? 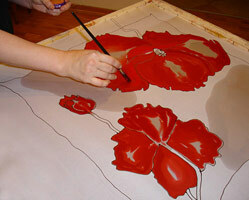 Just like a real painting, each of our handmade silk scarves is manually painted by our artists. They choose carefully the colours and put their heart and soul into the design of the scarves. We are using 100% natural silk to create unique hand painted silk scarves for sophisticated customers like yours who appreciate the original artistic creations! Bring our wearable art to your gallery! Contact us today at info@womenclothingtoday.com or 1-800-275-3165 and let us know what we can create for you!